The American Elasmobranch Societyis a non-profit professional organization of shark, ray, skate, and chimaera scientists. Each year, AES holds an annual conference in a different North American city where members meet and present their research. The 2013 meeting took place in Albuquerque, New Mexico from July 10-15th. The full schedule of talks (including other societies participating in the Joint Meeting of Ichthyologists and Herpetologists) can be found here. Presented below are selected tweets from the Ecology and Conservation sessions. July 10-15th in Albuquerque! I hope to see you there! The upcoming Joint Meeting of Ichthyologists and Herpetologists will include a research symposium focusing on the biology and conservation of durophagous (shell-eating) stingrays. Organized by Dr.’s Matt Ajemian (Texas A&M University Corpus Christi) and Julie Neer (Southeast Data Assessment and Review), this symposium aims to gather together the world’s experts on these ecologically important and poorly understood animals. It will include more than 15 research presentations, as well as a Q&A panel discussion and poster session. 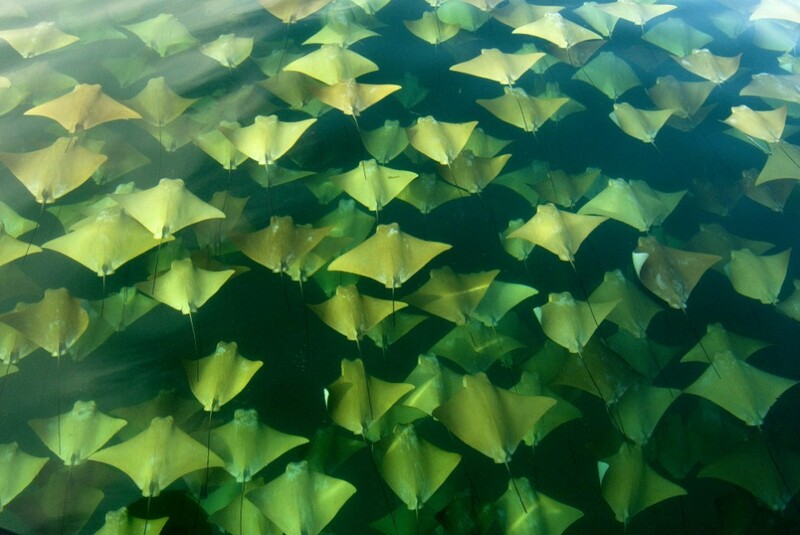 Though they were once best known for their visually stunning schooling behavior, durophagous rays like the cownose ray are now considered a pest species by many fishers because of their perceived role in the collapse of shellfish stocks in the Chesapeake Bay and elsewhere. This has led to a misguided targeted fishing campaign called “eat a ray, save the bay“. With their slow growth and limited reproductive rate, this is a receipt for a conservation disaster, particularly when paired with the extremely limited regulations governing the fishery. The symposium will cover this issue as well as the current state of biology and conservation of other durophagous stingrays, including spotted eagle rays and other perceived pest species like the Japanese longheaded eagle ray. For those of you attending the Joint Meeting, this symposium will take place Friday, July 12th from 8:00 a.m. until 6:00 P.M. (mountain time) . If you’re not attending the meeting, follow along on twitter with #RaysTheRoof (and #AES2013 / #JMIH2013, the conference hashtags). We’ll take question from twitter during the Q&A! Here are selected tweets from the Elasmobranch Ecology sessions. Here are selected tweets from the Elasmobranch Conservation sessions. Here are selected tweets from the Gruber Award (best student presentation) sessions.